Mary Beth Moser’s thesis is a bright example of scholarship in Women’s Spirituality. She brings passion, an acute awareness of the power of black madonnas, wide learning, and first hand experience to this study. Brava! 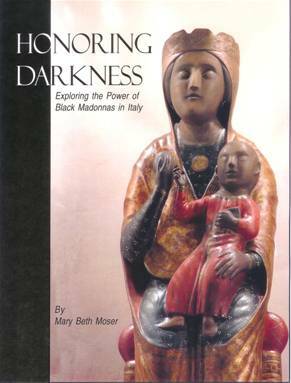 I ate up every word and gained a deeper appreciation for the Black Madonna and her dark, courageous power, her lineage in the long line of the Feminine Divine. I love how you shared what other women and men also felt about their own experiences/ encounters with the Black Madonna. In Mary Beth Moser’s powerful and beautifully-written work, I found core values of depth psychology: healing, wholeness, and a great respect for the Divine Feminine, the Sacred Mother of All. This book was a joy to read, and I enthusiastically recommend it. It was FANTASTIC and we felt really in communion with you and your journey. I am humbled by your work and willingness to share and be open to where she takes you. I can’t put it down. I want to send you a long-overdue thank you for your absolutely wonderful work and scholarship. I’m delighted that my work made a difference and has been helpful to you. We need to build on what each of us is doing and what we’ve done! For Non-USA orders, contact us via email before ordering at deamadre@comcast.net for the shipping cost. Add $3.00 tax if you are a Washington State resident. at deamadre@comcast.net for the shipping cost.